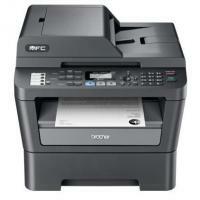 The Brother MFC 7460DN is a multifunction printer that provides print, scan , copy and fax features. It is an ideal solution for small offices as well as for home users. The printer comes with automatic duplexing feature, allowing users to print on both sides of the paper and also reduces paper wastage. The printer delivers not only crisp text outputs but also produces sharp graphics as well. The Brother MFC 7460DN toner cartridges is available in two capacities, helping users to save on money. The Brother MFC 7460DN comes in black finish along with neat and well organised control panel. It has a 35 sheet ADF and a flatbed scanner or digital copier on the top. The control panel has parameter selectors for fax, copy and print modes and an LCD screen to display the information. It also includes menu navigation keys and a number pad for fax number entry, with start and stop buttons at the right end. The device runs on 32 MB of memory. The printer has a standard 250 sheet tray along with one-sheet manual feed, allowing you to print on different print media. The printer supports ethernet networking for connecting multiple computers over a network and also offers USB port for connecting directly to a PC. The Brother MFC 7460DN printer serves as a personal mono laser multifunction printer with print, scan, copy and fax features. The printer supports automatic duplexing, ethernet networking, USB connectivity and also supports 35 sheet ADF which is capable of handling multipage documents and legal-size pages. It is a worthwhile multi-function printer, providing print, copy, scan and fax into a compact, desktop machine which produces fast printouts at a high print speed. However, it lacks additional paper handling options which may limit the productivity and lack of wireless connectivity might not be suitable for large business groups. How to improve the print quality of a Brother MFC 7460DN printer? Q. I’ve ordered Brother MFC 7460DN toner cartridges from your site. Is it necessary that I must be present at the time of delivery? A. Your signature might be required at the time of delivery for the Brother MFC 7460DN toner cartridges. However, while making an order through our website you are authorizing us to accept signature from another person on your behalf if the order needs to be signed for and you are not present on delivery. Q. I’m looking for a printer that can reduce paper wastage and includes dual capacities for its toner cartridges. Do you provide such printer? A. Unfortunately, we do not supply printers on this site, we only deal in cartridges and other printer consumables like paper. Brother MFC 7460DN is one such printer that allows you to print on both sides of paper and reduce paper wastage. Also, this printer supports dual capacities for Brother MFC 7460DN toner cartridges. To get this printer refer to other online websites. Q. What is the paper input tray capacity of Brother MFC 7460DN printer? A. The printer has a standard tray capacity of 250 sheets along with one-sheet manual feed, allowing the users to print on different types of media. Q. Which media types support Automatic Document Feeder and duplex print? A. Plain paper and Recycled paper support ADF and duplex print for this printer. Q. Is the printer a multifunction device? A. Yes, definitely. The printer is a multifunction device that provides scan, copy and fax features. Q. What are the missing features in this printer? A. The printer lacks wireless connectivity and mobile printing capabilities. Also, there are no paper handling upgrade options available in this printer. Q. What is the print speed of this printer? A. The print speed of this printer is up to 27 pages per minute. Q. The Brother MFC 7460DN toner cartridge will yield how many pages if I use it consistently for text and graphics both? A. The standard output capacity of the Brother MFC 7460DN toner cartridge (TN2220) is 2600 pages. However, the yield also depends on how much ink is used for each printout. For example, if we consider 75% of the page has been occupied by the ink (for use in text and graphics) then you can understand that the ink capacity will reduce. Q. Does Brother MFC 7460DN have a glass on which I can copy my documents? A. Definitely. Brother MFC 7460DN offers a scanner glass through which you can scan, copy and fax. If using a book, it will operate by feeding one page at a time. Q. My printer is showing ‘drum error’. What is wrong? Does it have anything to do with Brother MFC 7460DN toner cartridges installed? If the problem persists, it is time you replace the drum unit with a new one. Q. Hi I own a Brother MFC 7460DN printer. I was trying to print a few doc today and the printout is out of alignment and the size of the printed document is reduced when printing the document from Microsoft Word 2010. What should I do? A. This issue occurs if the paper size for printing was not set correctly before printing the document from Microsoft Word 2010. Please follow the steps below to set the paper size correctly. Open the document with Word 2010. Click the File tab and then Print. Click the setting for the paper size in the Settings section and choose the paper size you want to use for printing. When the document is printed without any issues, click Save on the File tab. Note that this issue may occur only if the paper size is never set before when creating the document. Before printing the document, we recommend setting the paper size and saving the setting by following the steps above. Q. I just replaced my Brother MFC 7460DN toner cartridge and the printer’s LCD continues to display the message "Replace Toner". What is missing here? A. If the printer's display continues to show the Toner Low, Replace Toner or Toner Ended error indication after installing a new Brother MFC 7460DN toner cartridge, follow the steps below to resolve the issue. Verify that you didn't replace incorrect consumable by mistake. Verify you are using a NEW Brother toner cartridge. When replacing the toner cartridge, you MUST install a brand new, unused Brother MFC 7460DN toner cartridge in order to reset the toner status. Swapping toner cartridges from one machine to another or installing a partially used toner cartridge may cause this issue. Brother printers control their image quality for the most suitable print quality by monitoring toner consumption. If you have installed a partially used toner cartridge, your Brother machine is unable to recognize toner consumption correctly which is causing this issue. So, make sure you have installed a new Brother MFC 7460DN toner cartridge, not a partially used toner cartridge from another machine. Verify the toner cartridge is installed correctly. If you have installed a new Brother MFC 7460DN toner cartridge but still the "Toner Low", "Replace Toner" or "Toner Ended" error indication remains, the toner cartridge may not be installed correctly. Reinstall the toner. This issue may have occurred because the corona wire has become dirty. Go to Downloads section of this website to check the latest version of the firmware. If you see the Firmware Update Tool in the Downloads section, check detail information to identify the firmware version. If the firmware version of your Brother machine is earlier than the latest version, update the firmware. Follow the installation instructions on the download page. If you do not see the Firmware Update Tool in the Downloads section, contact Brother Customer Service from "Contact Us" page on Brother’s official site. A. Toner cartridges are filled with powder form materials that may include, polymer, wax, carbon powder, resin, etc. Toner cartridges are used in laser printers such as Brother MFC 7460DN, while ink cartridges are filled with liquid ink and are used in inkjet printers.